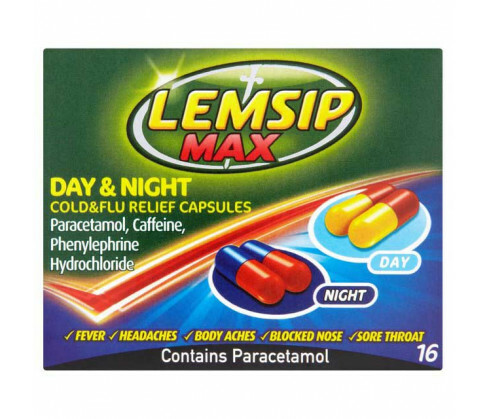 Lemsip Max Day and Night Cold and Flu Relief Capsules are recommended for the treatment of common cold and flu. The formulation contains two types of capsules ? red and blue for taking at night and red and yellow for taking during the day. The formulation provides effective relief in body aches, sore throat, fever, lethargy, blocked nose and so on. Never exceed the recommended dose or change the dose without medical advice. Always swallow the capsules whole along with water without chewing or opening them. Patients with renal or hepatic impairment or those suffering from diabetes, peptic ulcer, cardiac ailments, hypertension, closed angle glaucoma or prostate enlargement should use the medical after consulting a physician. Not recommended for children below the age of twelve years. The standard dose of the elderly, adults and children above the age of twelve years is day two capsules to be taken at intervals of four hours during the day and two night capsules to be taken similarly at night. Do not take more than six capsules (three doses) in entire twenty four hour time span. 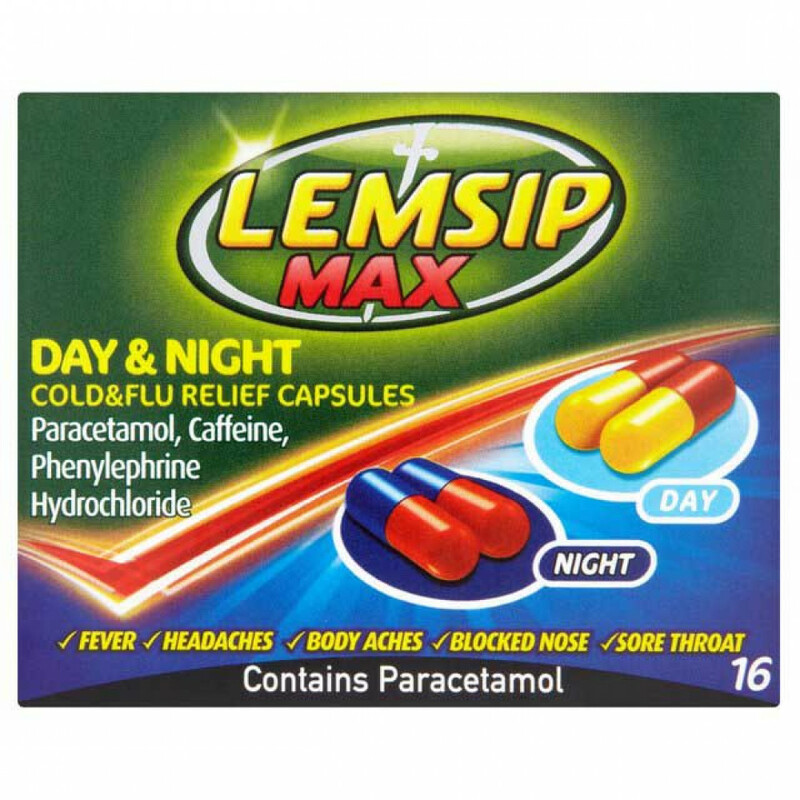 The active ingredients in both the capsules are Paracetamol 500mg and Phenylephrine hydrochloride 6.1mg. It also contains as excipients Maize starch, Sodium laurilsulfate, Croscarmellose sodium, Magnesium stearate, Sterilised talc, Gelatin, Quinoline yellow (E104), Titanium dioxide (E171), Erythrosine (E127) and Shellac.